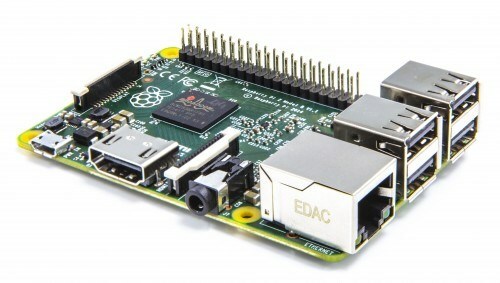 The Raspberry Pi 2 hit the market today! Priced at the same $35 price mark as the existing Model B+, the Raspberry Pi 2 offers an up to six times faster 900MHz quad-core ARM Cortex-A7 CPU, 1GB LPDDR2 SDRAM (twice as much) and lots of other feature improvements. The new platform maintains full compatibility with the original Raspberry Pi and thanks to its ARMv7 processor it can now run the full range of ARM GNU/Linux distributions. Interestingly, Microsoft also pledged support by promising a free Raspberry Pi 2-compatible version of Windows 10! More details about this Windows 10 version are expected in the coming months. Raspberry Pi 2 is available to buy today from our partners element14 and RS Components. Remember you’ll need an updated NOOBS or Raspbian image including an ARMv7 kernel and modules from our downloads page. At launch, we are using the same ARMv6 Raspbian userland on both Raspberry Pi 1 and 2; over the next few months we will investigate whether we can obtain higher performance from regular ARMv7 Debian, or whether we can selectively replace a small number of libraries to get the best of both worlds. Now that we’re using an ARMv7 core, we can also run Ubuntu: a Snappy Ubuntu Core image is available now and a package for NOOBS will be available in the next couple of weeks.